I spent some time playing with the cows at Ashram’s GoShala. Over 300 desi cows are taken care of here. Cows are separated in different sheds, based on their state of life- Normal cows are sheltered in one roof, cows in advance stages of pregnancy are kept in one shed, cows with small babies are sheltered in a different shed where calves have enough room to play, cows in breeding period are taken care separately. Most of the cows are Gir breed from Gujarath. They love being petted and scrubbed. Lovingly lick you and chew you if you go closer. I went inside the den and none of them got upset by my intrusion. 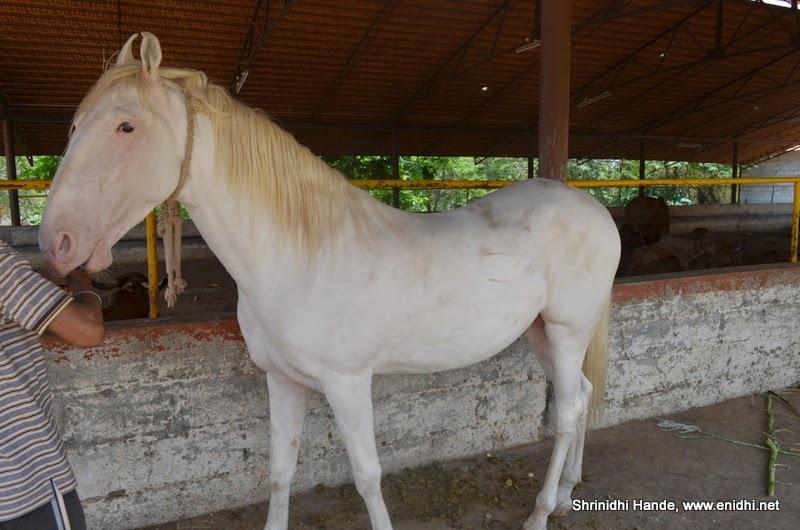 A white horse, named Raja is also part of the Goshala, but he seems very restless all the time, probably due to lack of female companion. He would try to bite and chew our hands most of the time when we try to pet him. Goshala’s care taker, Mr Naveen told us the importance of desi cows. Below are some points, as stated by him. - No of cows has a direct relationship with ground water level. - Indian Desi cows are being slaughtered for their leather. Hyderabad has India's biggest slaugther house. You may be vegetarian or not eating beef. But as long as you fancy buying leather products, cows will continue to get killed. Stop buying leather shoes, bags etc. - Countries like Brazil and Argentina are realizing importance of Indian breed of cows. Soon our desi cows will reach extinction and we might have to import from them. - Today’s children do not know cows give milk. Some of them believe cows give milk packets. 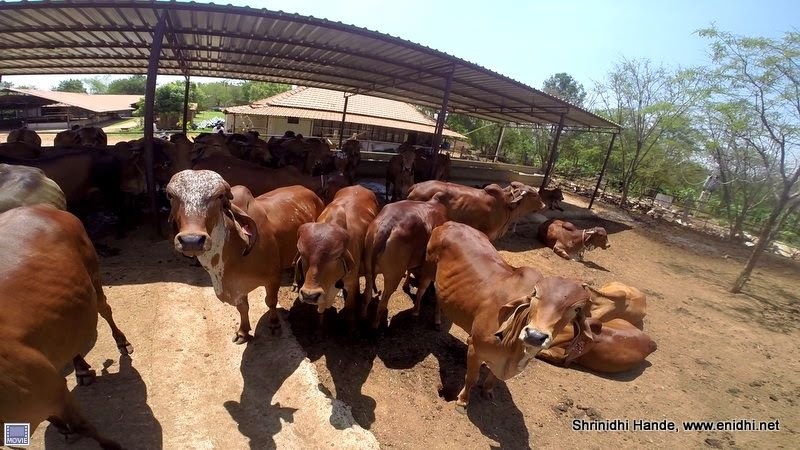 He said that GoShala is severely short of support staff- several years ago they began with 30 cows and 7 staff, even today there’re only 7 staff even though count has gone up to 300 cows. Names of each cow is pinned to its ear- you can read that and call it by its name. About 90 litres of milk is extracted from these cows each time (they are milked twice- morning and evening). Be informed that most of the Gir cows won’t give milk unless they get comfortable with their care taker. 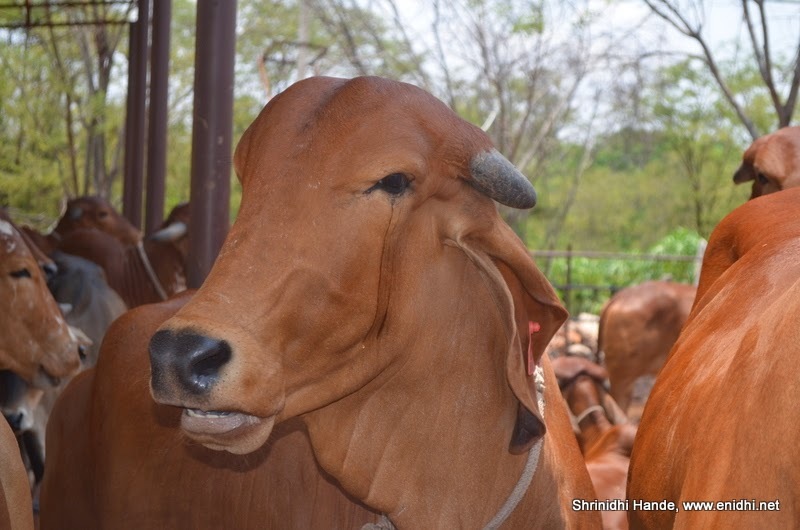 Those who visit GoShala can pet the cows, drink natural buttermilk (subject to availability) and spend some quality time with the friendly animals. I visited GoShala twice during my 2 day stay- it was a nice experience spending some time in the company of these cows. After seeing your first post on AOL, i visited AOL with friends. Had a nice time there.. Thank you..
Three was a free bus service at AOL which took us at all the places of AOL Campus. Good to know you visited. Yes, they have a guided tour. @Jayanthi- you should probably visit AOL Campus in person and speak to them to find out if there is a way. I need gir calves whether it is male r female no problem I want to take care them in my farm. Hi - can I adopt a cow with calf. I have land to grow fodder and I can take care of them well. Can anyone buy from you ?! You should visit AOL and find out.